7.30p.m. 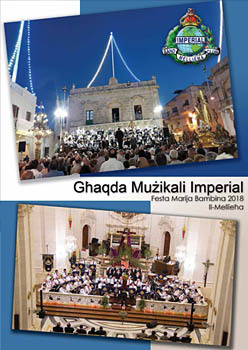 – Marċ u programm mill-Banda Imperial ġewwa l-Imġarr, Malta, fl-okkażjoni tal-Festa ta’ Santa Marija. 7.30p.m. - Band marches and musical programme by the Imperial Band in Mġarr, Malta, for the Feast of Saint Mary.